Posted on April 10, 2019 by Andy Higgs in Home. A full tank of gas? Check. Snacks? Check. Crowd-pleasing tunes that everyone in the car can sing along with? Check. Plenty of cash for purchasing roadside souvenirs and ice-cold sodas? Check! It’s time for a great American road trip. Whether you’re headed to the East Coast, the West Coast, or anyplace in between, there’s an unforgettable route that will convince you that the journey, not the destination, is what really counts. Join us as we explore six essential road trips to take. It’s difficult for modern-day travelers to imagine what life was like before interstate highways existed — or what a novelty it was to set off on a road trip without the now-ubiquitous conveniences of self-serve gas stations, drive-thru fast food restaurants, and chain motels. 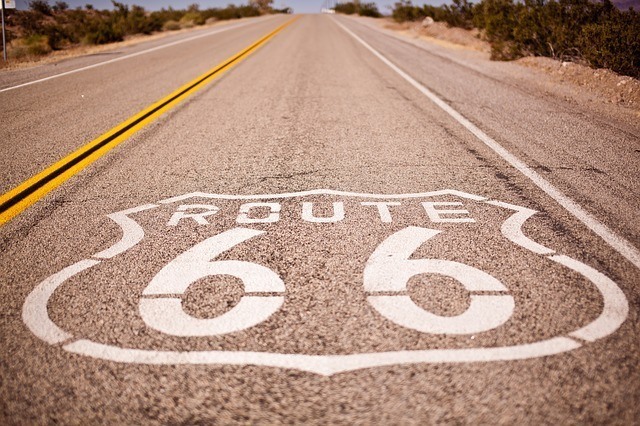 You can get a sense of the experience, and expose yourself to a real slice of American life, by traveling the historic Route 66. Stretching for some 2,500 miles, this road takes you through the heartland of our country, affording plenty of opportunities for exploring both a bygone era and a taste of today’s small-town life. Also known as California State Route 1, the Pacific Coast Highway takes travelers along one of the most scenic, and iconic, routes anywhere in the world. With stunning views of the Pacific Ocean accompanying you for nearly the entire trip up (or down) the California coastline, this trip is best taken with at least two drivers. That way everyone has a chance to ooooh and aaaah over the view without risking an accident! An added bonus to this particular road trip is that it takes you through breathtakingly beautiful locales, including the Big Sur area and Monterey Bay. You’ll want to build plenty of time into this journey, so that you can pull over whenever the fancy strikes you to wander around charming towns like Carmel-by-the-Sea. Cue up “Country Roads” on your car’s CD player as you embark on the relatively short, but incredibly scenic Skyline Drive. This 105-mile trip takes you through Shenandoah National Park in Virginia’s Blue Ridge Mountains and is a drive you won’t soon forget. Slow down to navigate the twists and turns — and so that you can brake in time to avoid hitting the deer, wild turkeys, black bears, snakes, and other critters that call Shenandoah home. You’ll also want to stop and sit a spell to soak in the incredible views, and luckily Scenic Drive has 70 overlooks inviting you to do just that. Nope, we’re not talking about the Autobahn — this Overseas Highway is right here in the good old US of A. And it literally goes over the ocean, crossing 42 bridges en route from Miami, Florida to its terminus in Key West. As you can imagine, being surrounded by water while driving is a pretty spectacular experience. If you can arrange your drive to take in either the sunrise or the sunset, do so — and make sure your passengers have their cameras at the ready to snap some eminently Instagrammable shots. It’s also a good idea to make a pit stop whenever the opportunity presents itself, since you won’t be able to pull over at anyone’s whim. Be on the lookout for grizzlies, gray wolves, mountain goats, and over 100 species of birds as you traverse the forest. You will also view incredible waterfalls splashing into glacial lakes. Driving through New England during the autumn, when the leaves turn brilliant shades of red, yellow, and orange, is definitely a bucket-list trip. Route 100 takes you through the heart of Vermont. The 146-mile drive borders the eastern edge of the Green Mountains and offers ample opportunity for hiking, sightseeing, and antiquing along the way. Stay at one of the many charming bed-and-breakfast establishments, and get ready to experience farm-to-table cuisine. Vermonters don’t put a lot of stock in national chains, so if you prefer to patronize small, local eateries and accommodations, you’ll really enjoy this bucolic getaway. Another option is to travel by RV, which lets you enjoy all the comforts of home while on the road. For peace of mind, you’ll want to look into a Good Sam fifth wheel extended warranty; no matter how gorgeous these road trip destinations are, you don’t want to be stranded due to a breakdown. Which Great American Road Trip Will You Take Next? With so many wonderful ways to experience the culture and flavor of these diverse United States, it can be difficult to decide on a destination! Whichever of these road trips you embark on first, remember to take it slow and allow plenty of time to stop and smell the proverbial roses, or to explore a promising sight that wasn’t scheduled on your itinerary. After all, that’s how road trip memories are made!